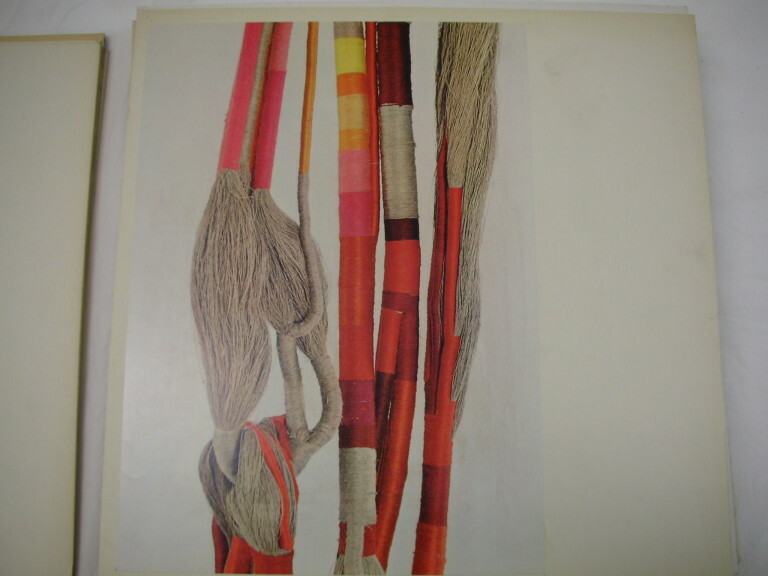 Colour photograph on mounting board of silk threads in pinks, yellows, oranges and reds wound around white linen threads. Part of Sheila Hicks Studio Loan Box T.504:1 to 17-1998. Among world civilisations, those of ancient Peru were probably the only ones which availed themselves to the full extent of the latencies in textile arts. Not only did they succeed like others in elaborating richly decorated surfaces, but they were unique in making bas-relief and even sculpture out of threads. 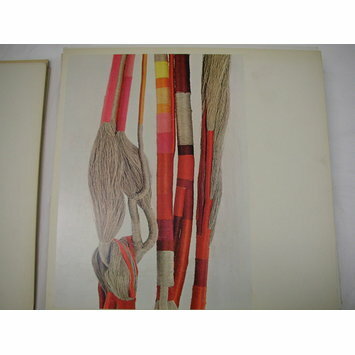 Overcoming the neglect and the oblivion in which these incomparable works have fallen, Sheila Hicks has retrieved and assimilated their tradition while marrying it felicitously to others such as those of Persia and India. Far from copying them, she has renewed them by original discoveries which appropriate them to the raw materials, the techniques and the aspirations of our time. Her wall hangings have the living warmth and the thickness of fleece; their complex structure and their shadows seem to chisel out perspectives attributable only to dream palaces; they offer the mellow depth, radiance and mystery of the starry sky. Nothing better than this art could provide altogether the adornment and the antidote for the functional, utilitarian architecture in which we are sentenced to dwell. It enlivens it with the dense, patient work of human hands and the inventive charms of a creative mind constantly stimulated by experiencing the gamut of those new materials which modern industry supplies, experiencing the gamut of those new materials which modern industry supplies, while remaining faithful to the immemorial rules of the most ancient perhaps of all the arts of civilisation. 1937 born in Hastings, Nebraska. 1953-59, studies at Yale University with Josef Albers and George Kubler. Fulbright to Chile (Peru, Bolivia, Ecuador) "Pre-Incaic Textiles". 1960-63 lives and works with apiculturist in Guerrero, Mexico. 1964 moves to Paris. 1966 begins weaving in Kerala, India. 1967 enlarges scale of work to make thread bas-reliefs for architectural contexts. Creates ATELIER DES GRANDS AUGUSTINS in Paris and TALLER ARTESANAL HUAQUEN COOPERATIVE in Chile. 1970 begins series of projects in Morocco. Lausanne Tapestry Biennale '67, '69, '71. AIR France, 8 of the 747 jets.